Go ahead – leave the beaten path. With low overhead costs, tough-as-nails construction, and unrivalled short take-off and landing abilities, this aircraft safely takes you wherever you need to go. 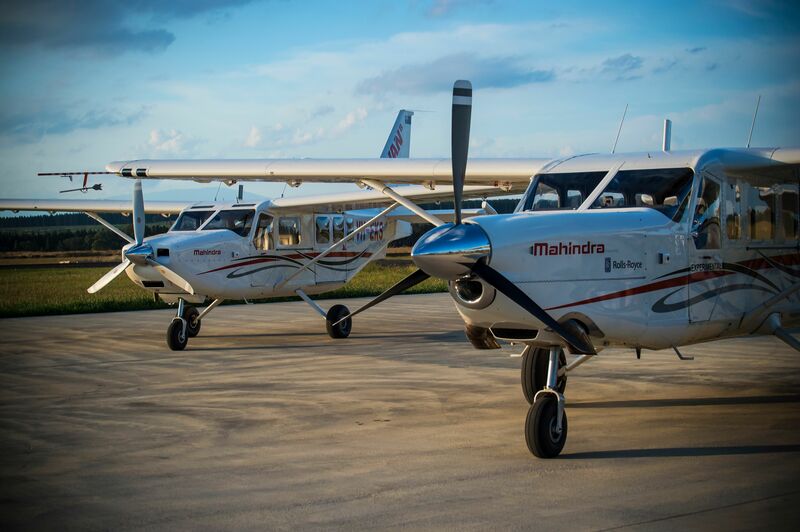 No other manufacturer of utility aircraft has committed to advancing the market by producing aircraft that are compliant to the latest FAR 23 safety regulations. Airvan 10 will provide a level of safety, you and your passengers can count on. Margins are tight and you need your aircraft to perform. With support from our worldwide network of parts and service, you will get more time in the air and more time to expand your bottom line. Whether you fly with passengers, cargo, or equipment, you’ll immediately see the benefits of the Airvan 10 cabin. Roomy with high-visibility windows, your passengers will enjoy the center aisle and legroom while being able to see the world above and below. Or, in just a few minutes, reconfigure the seats and utilize the large cargo capacity with easy-to-load-and-unload design features. Airvan is the aircraft with flexibility for more revenue-earning potential. Airvan 10’s turboprop engine gives it a nice boost to power as well as payload. Its Rolls-Royce engine produces 450-shaft horsepower and an unparalleled cost-per-seat mile, making this the most economical 10-seat in its class. Dr. Karthik Krishnamurthy has over 25 years of experience in the Aerospace industry in India and the USA. He has worked in diverse roles across aircraft and airborne system development, aircraft prototyping, flight testing and related technologies. Since joining the Mahindra Group in 2006, he has been a key member of the Group’s Aerospace team. He plays an active role in aerospace strategy formulation, business development and industry analysis alongside his current role as Director, Operations for the Aerostructures vertical. Dr. Krishnamurthy previously served as the Chief Technology Officer for Mahindra Aerospace with responsibilities for strategy management and coordination within the Aerospace team. Dr. Krishnamurthy has a Ph.D in Aerospace Engineering from the Texas A&M University and M. S. and B. Tech. degrees, also in Aerospace Engineering, from IIT-Madras. He also acquired a private pilot’s license while at IIT. Keith Douglas is the Chief Executive Officer of Mahindra Aerospace’s Aircraft business. He brings with him over two decades of managing multi-million dollar business enterprises in dynamic, competitive and turbulent environments. He has extensive practical experience in business transition, restructuring and integration, and has worked in the UK, Australia and New Zealand in the Manufacturing and Support industry across Electronics, Telecommunications and more recently, Aviation. As the CEO, Mr. Douglas is responsible for the implementation of strategic growth plans at the Aircraft division of Mahindra Aerospace. Prior to this, as the company’s COO, Mr. Douglas was responsible for optimizing day-to-day operations of the Aircraft division and led the business transformation in aircraft manufacturing, service and support. Mr. Douglas has a diploma in Electrical and Electronic Engineering, a diploma in Management and Financial Studies (both from Borders College, Scotland) and has attended the Mahindra Universe Leadership and Management program at Harvard Business School, USA. In the aerostructures business, secured funding from the parent Board to invest about $70mn and led the subsequent definition, creation, and operationalization of a comprehensive 25,000 sq.m. aerostructures manufacturing facility in Bangalore, India. In parallel, built strong technology partnerships and business relationships with major aircraft OEMs and their key suppliers, resulting in rapid ramp up and becoming a Tier 1 within 2 years of commercial operations. S.P. Shukla is a Member of the Group Executive Board of Mahindra & Mahindra Limited and as Group President, he is responsible for the Aerospace, Defence & Steel sector. In this position, he is the Chairman of the boards of several companies engaged in designing and producing aircraft, armoured vehicles, radars, naval systems and specialty steel. A B. Tech. & MBA, Mr Shukla has 36 years of rich and varied experience in managing large projects and operations. Prior to his current role, he served as President of Group Strategy and Chief Brand Officer of the Mahindra Group. He oversaw and orchestrated a complete makeover of the visual identity of the Mahindra Group. It was during this period that the Group Strategy Office launched and institutionalized Rise Prize (with Prize money of US $1 Million) that aims to foster and develop the innovation eco-system in India. He has also been responsible for Mahindra Racing portfolio – both MotoGP (Motorcycle) and Formula E (Electric Cars) in his capacity as Chief Brand Officer. Mr Shukla is affiliated with several renowned industry forums. Besides the India-Spain CEOs Forum, he is also a member of the Indo-French CEOs Forum, India-Israel CEOs Forum and the Indo-French Chamber of Commerce & Industry. He is the Co-Chairman of FICCI Committee on Defence and CII National Council on Aerospace and a member of the Technology Development Board, Department of Science & Technology – India.